Some might recognize our grave-side book reader as Suzanne from the comic strip Don’t Pick the Flowers. The artist, David Hurley allow her loan to Flatt Bear. David did a fun little strip on Friday that fell perfect with my story line. Check it out. I finished the sketch cards for the three lucky winners of the contest from last week. 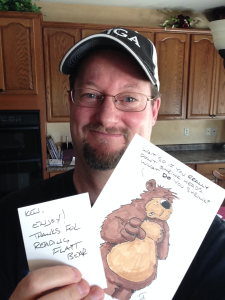 In fact, here’s Kenny who received his sketch card this weekend. What’s funny is Kenny happens to be a good friend of mine who live a few miles from me and I was able to hand him his card personally. Not intentional, but funny how that worked out. He sent me this picture with the words: “Dreams do come true.” Well I’m glad I could be a part of filling your bucket list Kenny. The other two folks will be getting their card soon. The rules of Book Club is that you do not talk about Book Club. At 1st I though that was a photo of you P.J. Nope. I’m not that handsome. Yes. A little tooooo quiet. I love it. Thanks PJ! Hahaha I know her! It’s Suzanne! love the crossover P.J.! Thanks. She sure looks natural there, doesn’t she?